Among the political ideologies generally considered to be of continuing significance, anarchism alone has never been implemented. Perhaps its rigors are too strong and its advocates are too weak. That it is still considered worth studying is testimony to its intellectual credibility, particularly its single-minded emphasis on individual liberty. Obsession with liberty and skepticism of government are as alive today as they were in the nineteenth century. This book offers a comprehensive introduction to anarchism in the United States, revealing its historical roots and relevance to today's problems. 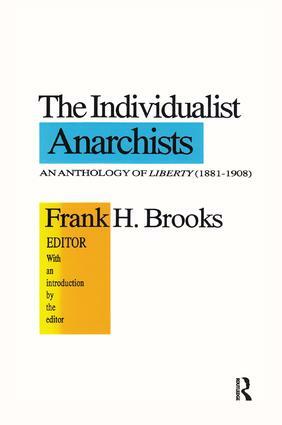 The relationship between anarchy and individualism in the nineteenth century is well known. How this affected the larger system is what the bulk of the anthology is about.Liberty was a magazine featuring some of the outstanding anarchist thinkers in America at the turn of the century. This anthology offers a selection of writings spanning the magazine's twenty-seven year life and features some of its major writers: Benjamin Tucker, Victor Yarros, Steven Byington, John Beverley Robinson, and Gertrude Kelly. The chapters are divided into four sections: political theory, economic theories and reforms, social implications, and strategies of individualist anarchism. The authors criticize censorship, state support of patriarchal marriage, and the general invasion of privacy. Though quite radical, the writers were not revolutionaries in a conventional sense; they emphasized passive resistance, rather than violent assault, as proper.The Individualist Anarchists is not merely of historical Interest, but offers a fundamental critique of government and authority - one that remains a relevant part of today's libertarian movement. It will be of Interest to political theorists, economists, sociologists, and scholars of American history; above all, to those who may not yet have appreciated the worth of an analysis made so many years ago.